Whew! That's it! The final candidate forum of the 2008 cycle is done, finished, in-the-can! 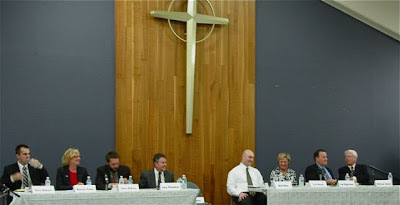 Last night's forum, held at the Presbyterian Church of the Covenant on Fairview, was another success. The sponsors - faith-based groups - did a fine job of conducting the event before an audience of nearly 70 people total. Around 50 people stuck it out to the very end. You can read Daily Pilot reporter Alan Blank's account of the meeting HERE. The moderator, Daily Pilot columnist and long-time community activist Jim deBoom, did a good job of firing the questions at the candidates. With only a minute for each response, the candidates had to be quick with their replies. Since this is the final forum they all had learned the mechanics of the process by now. Having had most of the questions in advance helped - it gave them a chance to prep for their answers. Again, Mayor Eric Bever was a no-show. I guess he must feel he's got this election in the bag because this is the second forum in as many weeks - neither of which were televised - that he has failed to show for. Talk about arrogance! The editors of the Daily Pilot were right when they chose to ignore him when preparing their endorsements. And, again, Old Grumpy from Mesa North made only a cursory showing, arriving more than 15 minutes late and leaving after around a half hour. He immediately slithered back to his Mesa North cave and wrote a scathing comment on a pre-existing blog entry - he's getting lazy that way lately - denouncing forum participants as a "bunch of phony blowhards". Of course, since he only stayed for a few minutes, took no notes, then bugged out, he really has no idea of the nature of the questions or comments after he left. This is his style - fabricating facts and outright lies. He followed that up with another fear-laced attack on those candidates who pose a threat to his troika with the specter of rampaging gang, bars on doors and windows in Mesa del Mar, etc. The guy really is a racist fear-mongerer. The hosts of the forum presented each of the candidates with four questions, plus a couple composed by members of the audience. The four "canned" questions were: 1) How each candidate would educate themselves on the needs of the community, particularly the youth? ; 2) In light of the current fiscal uncertainty, which budget items should not be reduced and which are the most expendable? ; 3) Do they support or oppose a gang prevention program as well as enforcement? ; 4) who do they feel is the most under-represented group in our city? Alan Blank's article covers many of the details of the answers. In the case of the first one, each would do some form of "reaching out" to the community and/or staff. On the subject of budget plans, the consensus was that public safety can't be touched. Foley emphasized the fiscally conservative nature of our city staff. McEvoy suggested eliminating the pay for City Council members and instituting a city-operated towing operation to generate income. Reedy again bemoaned the loss of the opportunity for the public to consider an increase in the Transient Occupancy Tax (TOT). On the subject of a gang intervention program, most candidates supported that concept, acknowledging that enforcement alone isn't enough. Righeimer said we need programs that work - duh! WHO IS THE MOST UNDER-REPRESENTED? The final question from the hosts, about which group in our city they feel is the most under-represented, evoked some interesting responses. Moss, Sneen, Reedy and Foley all said it was the youth of our community. Bunyan said it was the seniors and homeless. Righeimer said it was those in our community who were "least, last, lost" - the homeless. McEvoy said it was the Latinos, which represent 38% of our population, and cited the fact that there were no Latinos running for office. Monahan, predictably, said it was the seniors and those with physical or developmental disabilities. The first two questions submitted by audience members dealt, in broad terms, with affordable housing and the demise of the Job Center, primarily as those issues effect the Latinos in our city. All candidates agreed that we need affordable housing, but the practicalities of where it would be placed is a big stumbling block. The Job Center was a a more contentious issue. Some of the answers were predictable. Monahan does not support re-opening a Job Center. Foley voted against closing the old one. Reedy, Sneen, McEvoy and Bunyan think we should open another one. Bunyan said we need better rules and enforcement. Sneen thinks a training element should be included. Moss said we should look to private enterprise to provide job placement services. An audience member submitted a curious question about what the candidates would do to revitalize the Eastside - implying that all the attention had been paid to the Westside. Most responses had to do with infrastructure - traffic improvements, alley improvements, etc. Reedy mentioned the fledgling Eastside Costa Mesa Neighbors group. Jim deBoom asked a series of "yes or no" questions. All the candidates supported caps on flights out of John Wayne Airport, building a new central library and all agreed, if elected, to meet with the sponsoring group of this forum. None of the candidates felt Paularino Park should be returned to a state where soccer could be played. This final chance to see and hear most of the candidates only further cemented my decisions on how to mark my ballot - which I will be doing today. I will vote for Foley, Righeimer and Sneen. The Daily Pilot ran an abbreviated version of my recent blog posting on my choices yesterday, which can be read HERE. I'm still very impressed with all the candidates. Both Chris Bunyan and Chris McEvoy continue to impress me with their insightful, and sometimes quirky, solutions to problems. The buzz around the meeting room last night was all about the recent article in the Daily Pilot about the "donation/consulting fee" paid to Gary Monahan by businessman Surat Singh. I don't know how this issue is going to shake out, but it seems to me that it is easily resolved - just give us a peek at the check Mr. Singh wrote to Monahan. If it was made out to Monahan's campaign, case closed. If not, then more explaining is necessary. That's it, my friends. Time to contemplate how you will mark your ballot. Remember, this weekend CMTV will have a forum marathon going, with the first three available for viewing. The Daily Pilot has their video interview clips available for viewing. Take some time to view these items and make an informed decision. Is Bever really being arrogant, or has he simply quit? Seems like Riggy, Foley and Monahan (maybe) are the front runners right now. Regardless, for the Mayor (albeit a position that was handed to him on a silver platter by Mansoor) to not even bother showing up - twice, no less - that's pretty pathetic, whether arrogant or a quitter. Question: How can you tell when Monahan is lying? This would be funny if it were not so true. Is there any polling available for this city council race? What if these forums have only a minimum effect on the electorate? What if they have a negative effect and the only one gaining is Bever? Well, it is too late now. The forums are over. If Bever wins, or if he is the top vote getter, no one will trust these forums again. Something to think about. On another subject, is Katrina going to employ any strategies to ensure her election like a "bullet ballot" where her supporters only vote for her to make sure that no one like Monahan for instance, moves up because some voter wanted to fill up their ballot and didn't know who else to vote for? Kent, good questions. I know of no polling data, but I'm sure some exists. By my count, the forums - not counting the "meet and greet" at Mesa North - attracted slightly over 550 members of the live audience. Many of those were returnees. The first three are being televised now and are also available for viewing on streaming video on the city web site. We have no idea how many people view them in either medium. We also have no idea how many people consider views such as the Daily Pilot endorsements, Mansoor's commentary and my recent letter in the Pilot, which was a trimmed version of my views here in an earlier post. We really have no idea how these blogs affect elections yet, either. We do know a few people read this one and some read the CM Press, CM Truth and CMunimPRESSed, but we don't know how they are affected by what they read - except to get ticked off, in the case of this one. Sadly, many - probably most - people don't make up their mind until they step into that voter booth next Tuesday - then they look for a familiar name. I readily admit to having been one of those people until about 10 years ago. Bever will certainly get votes because of his illegal signs all over the city, plus being an incumbent mayor helps - thanks to Allan Mansoor for that bit of skulduggery. Don't lose heart - Mansoor beat Linda Dixon, who was then the incumbent mayor. I don't know how "bullet voting" would help Foley this time around. Clearly, she's a popular candidate, so if people vote for her and those candidates more clearly aligned with her views on issues - like Reedy, Sneen, Bunyan and McEvoy - that will strip potential votes from others, including the Mesa North Mouth's troika. Geoff, thanks for the great recap. Due to work issues, I have been completely unable to attend these forums, much to my dismay. Kent, I think that these forums are important, simply because the folks that go are likely to share their opinions with their neighbors. I have answered numerous questions from co-workers who are totally ignorant of Costa mesa politics and who had no idea to vote for. I'm one person, yet I spoke with over a dozen others, so multiply that. We'll see on Weds. just how important these forums are. I just got a slew of mailers in my mailbox tonight. The most baffling one was the "Voter Guide" addressed to Republicans that had Foley, Righeimer and Monahan as a slate. What's up with that?? ?